Once again I am featuring the painting of a kitten from Kitty Harbor who was up for adoption. If Carlisle isn’t still up for adoption, I bet they have another kitten who is almost as handsome. 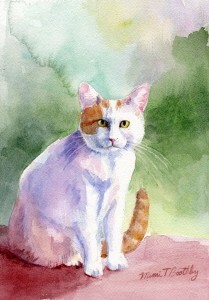 This painting measures 6.25″ x 8.25″ and is painted on fine arches paper with transparent watercolors. It is for sale for $100.00 and half of the proceeds go to Kitty Harbor. Eventually this painting and the one of Meggy will be made into note cards. Isn’t she adorable? She’s up for adoption. 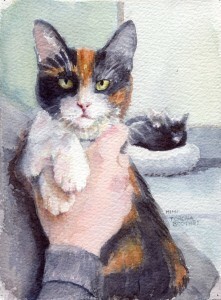 I have had a few calico cats in my life. Of all the cats they have the most fun markings, but can still get lost in dappled shade because of their protective coloring. This little cat is hoping to be adopted this weekend at Kitty Harbor. 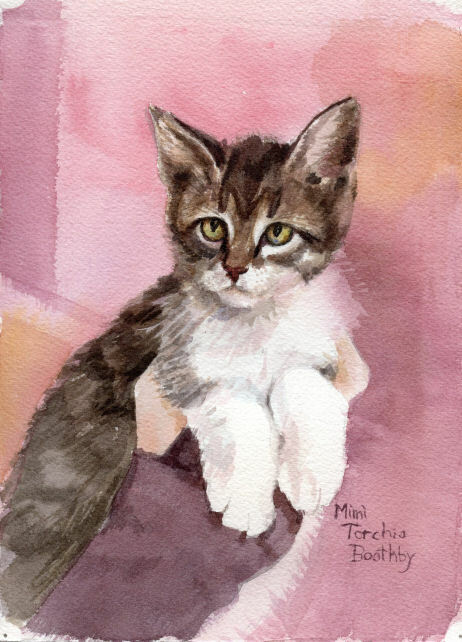 If you want to buy her portrait, I will donate half to Kitty Harbor. And if you want to adopt Meggy, if you’re lucky, follow the link and she might still be available. When my sons were still in their teens and living at home, we decided the house needed a kitten. We started looking for one, and one day my mother called me, she had found an ideal kitten, tiny, friendly, a little silver tabby. We brought her home and we named her Barbie-Q. That name was not my idea, but it stuck. She was a great kitten, she wasn’t afraid of the older cats, she did well with my sons and our dog and entertained us endlessly like kittens should. About a year after we got her, a relative came to our house and stayed for a week with her young children. I gave them the house rules, no cat chasing, and no one is allowed in my bedroom, that’s where the cats can safely hide. Well, after a week of those small boys running amok, Barbie had changed, and for about 10 years she was a rather unpleasant cat, fearful, apt to strike out without warning, noisy. I guess cats can get PTSD too. One of the things that helped her come around was when I started fostering feral kittens. Barbie loved all the kittens. Finally she found someone smaller than she was! I adopted two of those little kittens and she quickly befriended them and played happily with them until they got bigger than she was. She continued to run and play, jump and cavort like a kitten until her very last days. This is a commissioned portrait of her, in one of her most familiar poses, high above us on some piece of furniture, watching. I liked the way Cream puff posed for me so much that I painted her again, this time on fine Arches paper measuring 7″ x 10″. The colors and the paper cooperated with each other to make wonderful designs in the background.